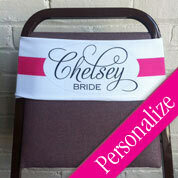 Use with a formal chair cover, or without - the chair sash looks beautiful either way. 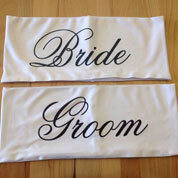 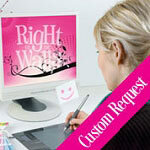 We'll print your wedding logo, or names directly on the sash. 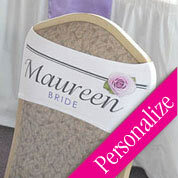 No long bows to tie or trip over - the sash is stretchy, flat and comfortable. 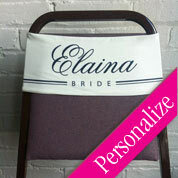 Make a beautiful & unique presentation at the wedding party table — by putting everyone's first name on their chair — or go all out and have your wedding logo printed on the chair of every guest.